David Einhorn went back on the offensive against Apple Thursday, reiterating his call for the tech giant to stop hoarding its cash. Einhorn, an activist shareholder and manager of Greenlight Capital, wants Apple (AAPL) to return some of its $137 billion of cash to shareholders in the form of preferred stock. Einhorn claims that preferred shares, or iPrefs, as he calls them, are a better way to reward shareholders than stock buybacks or dividend hikes. "Apple and its shareholders want a solution," he said, during a conference call Thursday, adding that preferred shares "are the best solution to unlock shareholders without impinging on Apple's plans." Einhorn said iPrefs would unlock about $150 per share in additional value for shareholders, compared with a maximum of about $85 per share through buybacks or dividends. "We hope Apple agrees with us that iPrefs are an innovative idea who's time has come," he said. Related: Einhorn to Apple: Give us more cash! In a lengthy presentation, Einhorn said that technology companies tend to hoard cash in order to make acquisitions and avoid relying on Wall Street for financing. Many in the tech industry "view their self-importance by the size of bank accounts," he said. But the crux of Einhorn's argument is that hoarding cash is bad for investors and bad for Apple. He compared stockpiling cash to having an inventory problem, where cash sits unused on companies' balance sheets for years, earning next to nothing. Einhorn singled out Dell (DELL) as an example of a company that took cash hoarding to an extreme. "We found their attitude toward cash allocation so unappealing that we sold stock," he said. Einhorn seemed to suggest that Dell CEO Michael Dell had welcomed the decline in Dell's share price, saying it helped Dell take the company private. Once the buyout of Dell is complete, Michael Dell and his private equity partners will be able to use the company's cash as they sees fit, said Einhorn. "When it's their money, they don't need so much rainy day cash," he said. Einhorn also dismissed the idea that returning cash to shareholders is a sign that a company's growth prospects have dimmed. He said "shareholder friendly" companies, such as IBM (IBM) and Texas Instruments (TXN), tend to be rewarded by the market with higher valuations. Both companies offer healthy dividends and stock buybacks. For its part, Apple has said that its board will "thoroughly evaluate" Einhorn's proposal and has been in discussions about returning cash to shareholders. The company has already returned $10 billion to shareholders and has plans to return another $35 billion. Einhorn filed a lawsuit earlier this month in response to a shareholder proposal that would prevent Apple's board from issuing preferred shares. The case went to court Tuesday, but it's unclear when a ruling will be made. 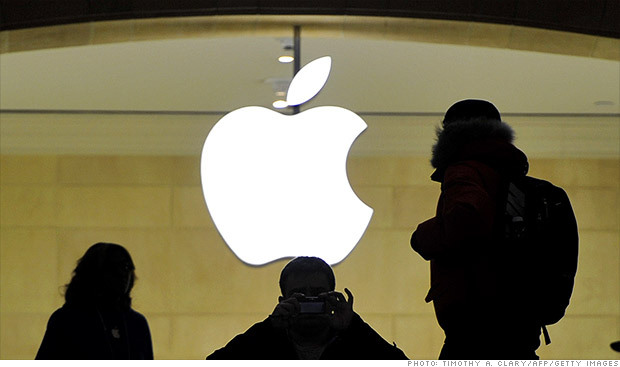 Apple will put the proposal to a vote at the company's annual meeting next week. Speaking at an investment conference last week, Apple CEO Tim Cook called the lawsuit a "silly sideshow." But he acknowledged that the company would evaluate Einhorn's proposal. "I have no reason to doubt Tim Cook at his word when he says he's going to evaluate this seriously," Einhorn said Thursday. "And I expect him to do so."